Ahead of Saturday's 11:30am deadline, we have combed through all 20 Premier League press conferences to bring FPL managers the need-to-know team news, injury updates and predicted XIs for DGW25. 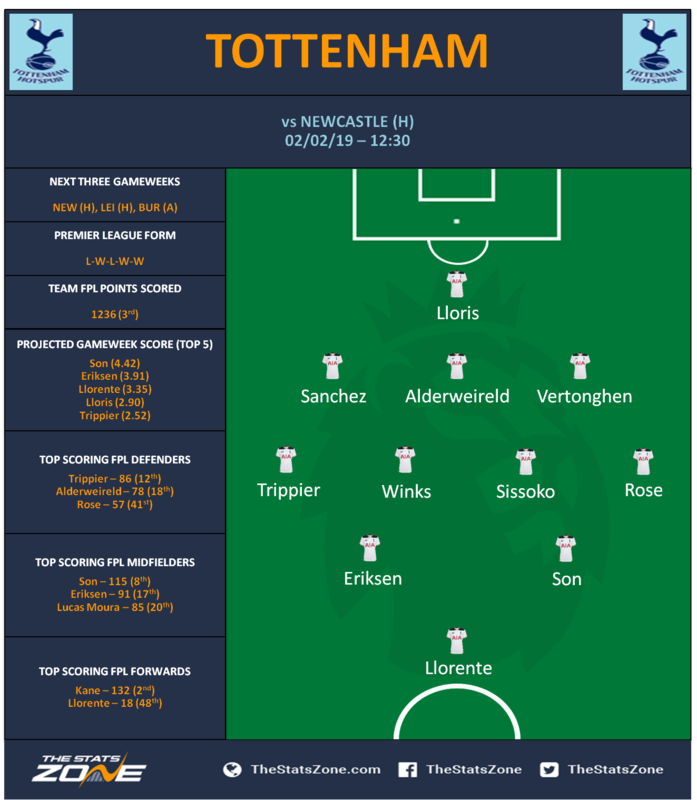 The Stats Zone's other Double Gameweek 25 FPL content includes Captain Picks, Fixtures, Projections & Team TSZ Discussion. Koscielny should replace Nacho Monreal (£5.4m) at centre-half, though the Spaniard could form part of a back three if Unai Emery opts for a wing-back system. Aaron Ramsey (£7.2m) will compete with Mesut Ozil (£8.0m) for the role behind Pierre-Emerick Aubameyang (£11.3m) and Alexandre Lacazette (£9.3m). 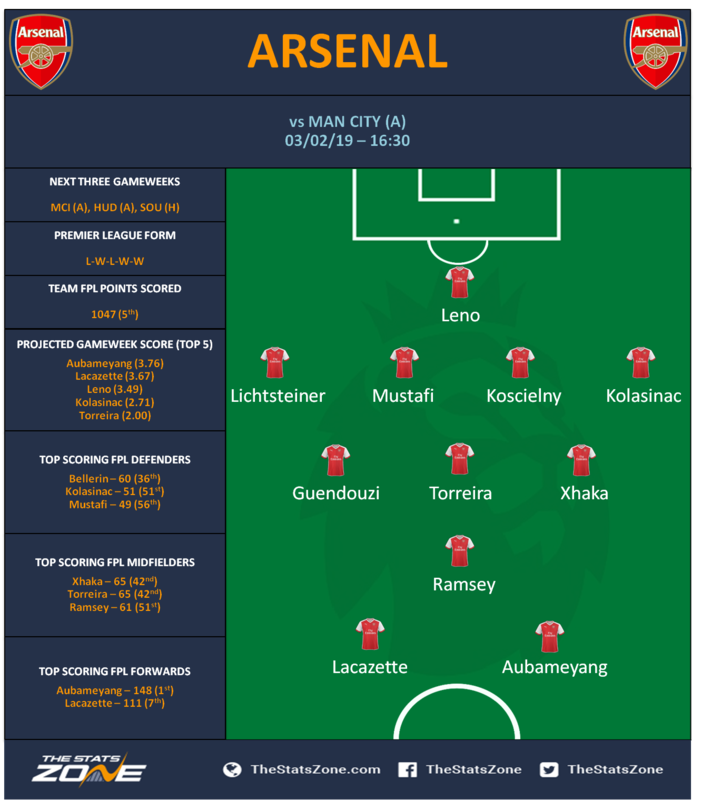 ‘Auba’ could play as more of a left forward, while a back-three system could even see ‘Laca’ omitted from Emery’s starting XI. Alex Iwobi (£5.4m) will also be pushing for a start. Eddie Howe said this morning: “Callum Wilson (£6.4m) is definitely out. We'll wait and see how Jefferson Lerma (£4.5m) is today and make a late call on his fitness.” The Cherries boss admitted on Wednesday that Wilson had minor knee surgery “to clean it out”, with the striker expected back in 3 to 4 weeks. 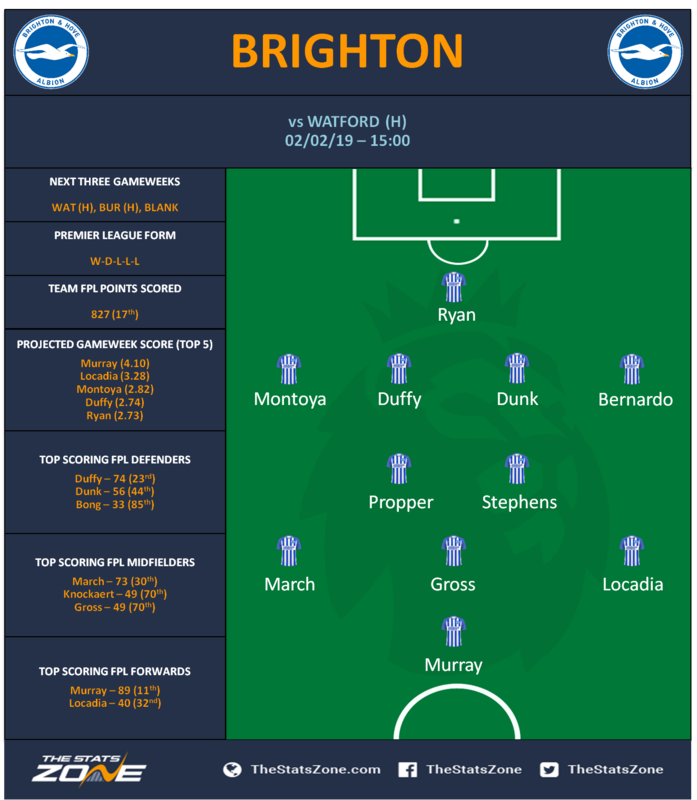 Bruno (£4.4m) is an option over Martin Montoya (£4.3m) at right-back, while Florin Andone (£5.0m) may have to settle for a place on the bench again after Glenn Murray (£6.3m) bagged a brace in Brighton’s 4-2 loss at Fulham on Tuesday. 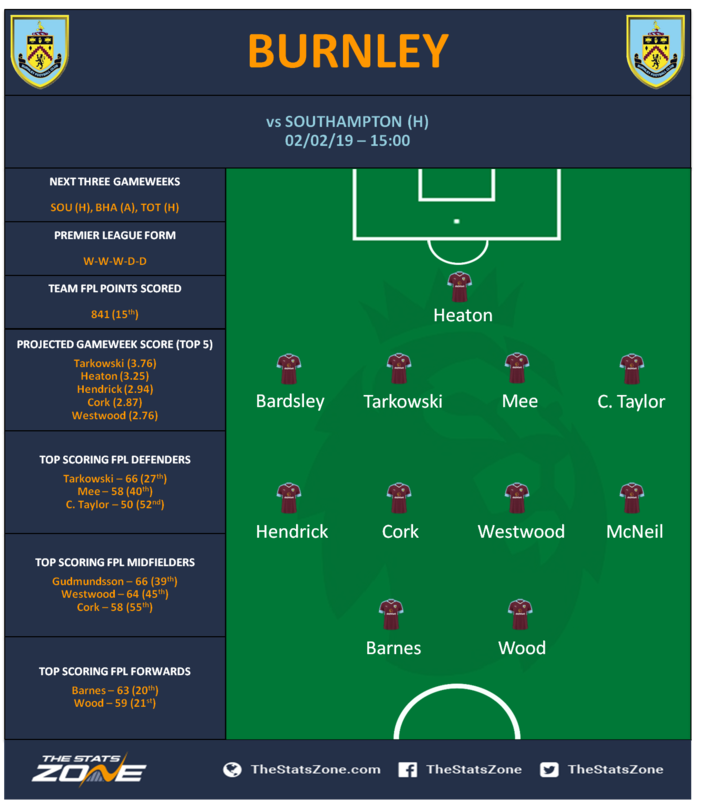 Johann Berg Gudmundsson (£5.5m) and Robbie Brady (£5.4m) are back in contention for the Clarets. 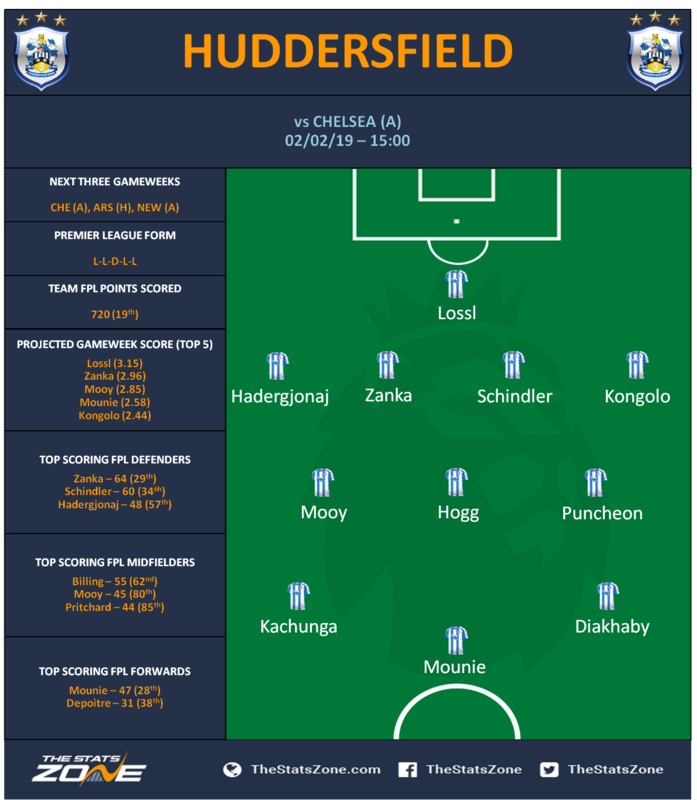 Jeff Hendrick (£5.2m) is probably the player most at risk of dropping out of Sean Dyche’s XI for one of the two widemen. Matt Lowton (£4.6m) and Steven Defour (£5.3m) are unlikely to be available. Peter Crouch (£4.5m) has joined Burnley, with Sam Vokes heading the other way to Stoke City. 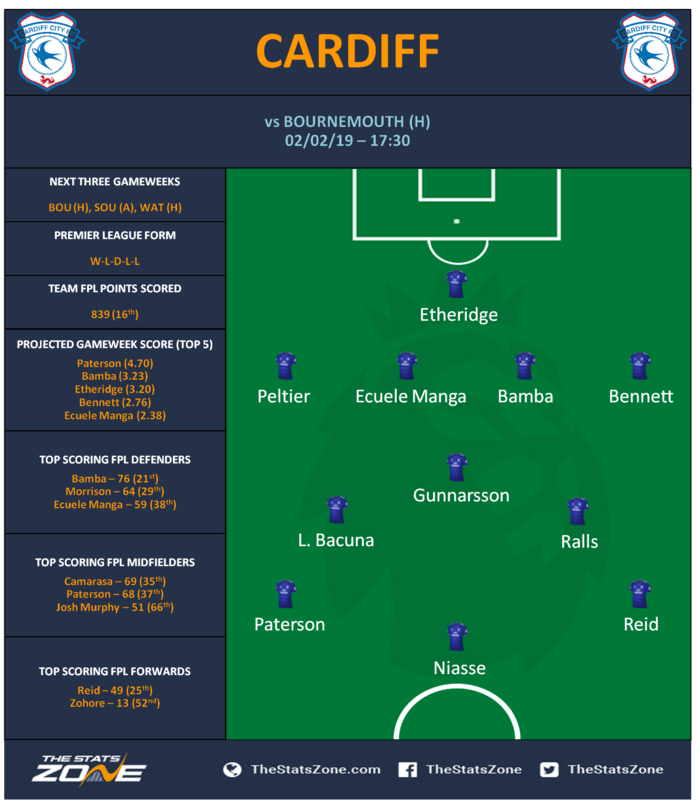 Sean Morrison (£4.7m) remains out for the Bluebirds, while Victor Camarasa (£4.6m) and Josh Murphy (£4.8m) may not be ready for Bournemouth’s visit tomorrow evening. Neil Warnock said: “Morrison is probably a week or 10 days in front of where we thought, he could be four weeks but we don’t want to rush him back. Victor has been struggling, Murphy has been struggling, so we’ve got to get these lads firing.” Harry Arter (£4.9m) is ineligible to face his parent club. 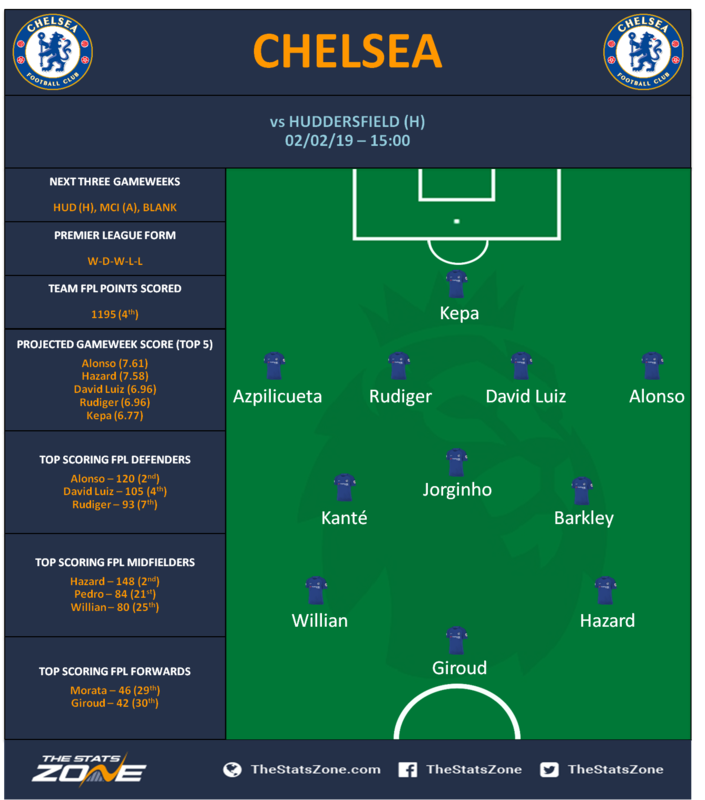 Olivier Giroud (£7.7m) could earn a start if Higuain is not risked from the outset, though Sarri also has the option of reinstating Hazard as a ‘false nine’ in order to play both Pedro (£6.3m) and Willian (£7.2m). Ross Barkley (£5.1m) could replace Mateo Kovacic (£5.7m), while Marcos Alonso (£6.5m) will be aiming to reclaim the left-back spot from Emerson (£5.2m). 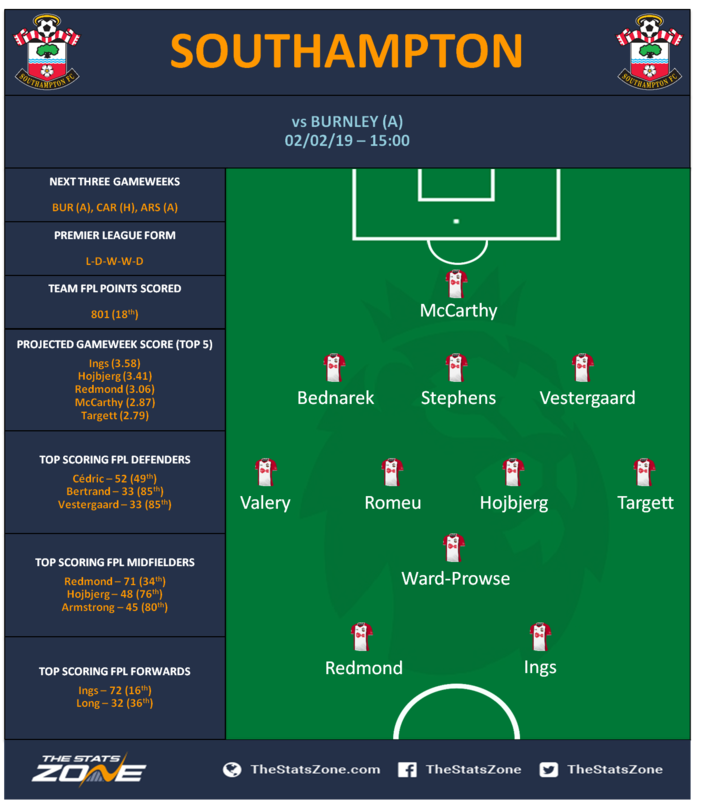 Considering Chelsea’s abject display at the Vitality Stadium, further line-up alterations would be no surprise. Yerry Mina (£5.4m) and Phil Jagielka (£4.3m) are both out for Everton, while Leighton Baines (£5.0m) and Idrissa Gueye (£4.8m) require late fitness checks. With Lucas Digne (£5.3m) suspended for the first of Everton’s two double gameweek fixtures, Jonjoe Kenny (£4.2m) is set to deputise at left-back if Baines is ruled out. 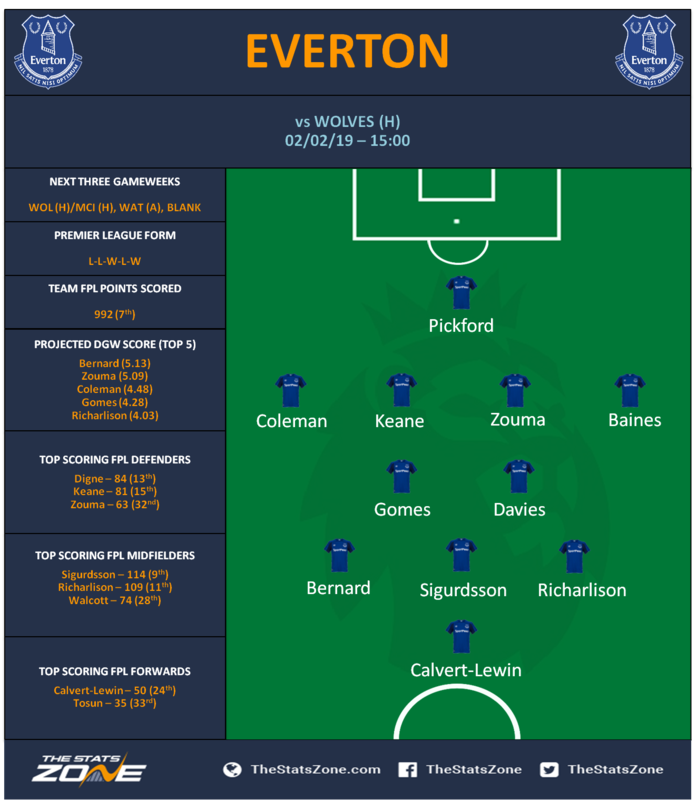 Silva may opt for the athleticism of Dominic Calvert-Lewin (£5.3m) up front against Wolves, after Cenk Tosun (£6.5m) earned a rare start in GW24. 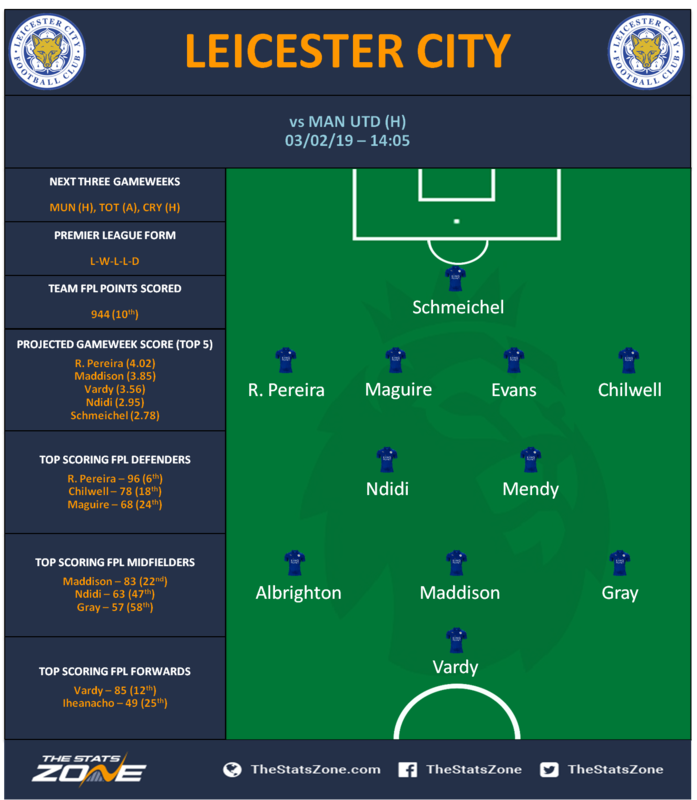 Richarlison (£6.8m) could also move into the No 9 role, with Ademola Lookman (£5.1m) and Theo Walcott (£6.0m) options in attacking midfield. Claudio Ranieri did not report any new injuries at his press conference on Thursday and made no mention of Joe Bryan (£4.8m), who went off with a leg injury on Tuesday. 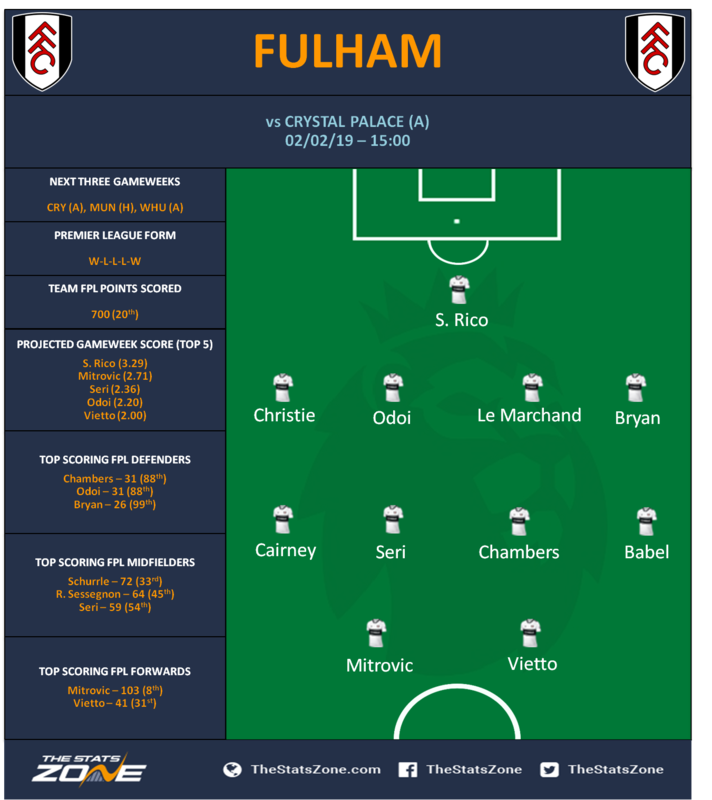 Ryan Sessegnon (£6.0m) is a likely starter if Bryan fails to recover in time. Luciano Vietto (£5.3m) replaced Andre Schurrle (£5.6m) at half-time before netting Fulham’s fourth against Brighton and may oust the German tomorrow. Aboubakar Kamara has joined Turkish side Yeni Malatyaspor on loan for the remainder of the season, while the club brought in Havard Nordtveit (£4.5m) and Lazar Markovic (£5.0m). Having earned a 1-1 draw at Anfield on Wednesday, the French manager may be tempted to stick with the same XI for the visit of Man United. Jordan Henderson (£5.3m) operated at right-back for the Reds’ 1-1 draw at home to Leicester on Wednesday night. James Milner (£5.6m) is expected to return as deputy in that position, having served a one-match ban in GW24. Dejan Lovren (£4.9m) could earn a start ahead of Joel Matip (£4.9m), while Fabinho (£5.5m) might replace Naby Keita (£7.1m). 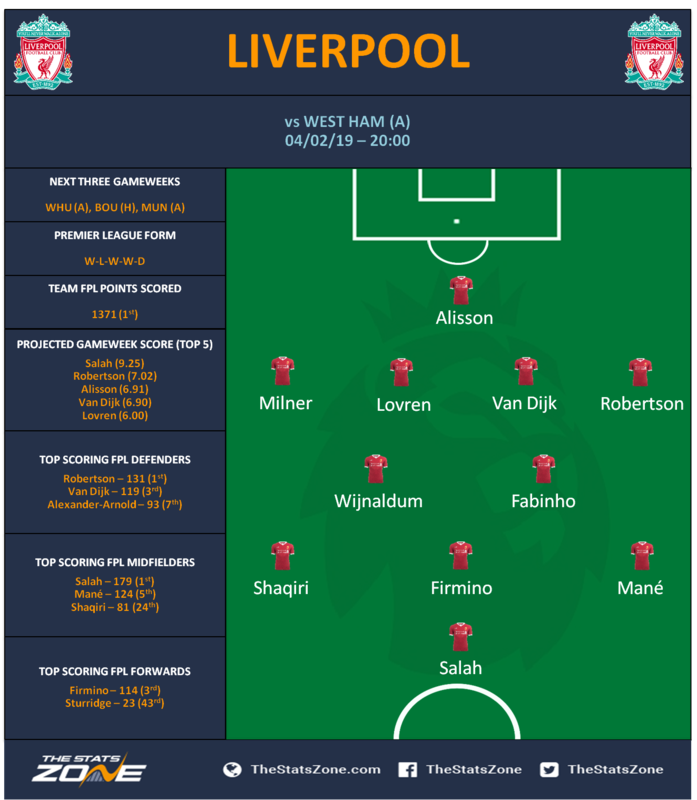 Klopp could also opt for a three-man central midfield, which would force Xherdan Shaqiri (£7.1m) onto the bench. Adam Lallana (£6.9m) is another option in the middle third. Vincent Kompany (£5.2m) remains out for the Citizens. Guardiola stated that the rest of his squad trained on Friday, suggesting Ederson (£5.6m) is fit after sustaining a leg problem at St James’s Park. With Sunday’s visit of Arsenal followed by a trip to Everton on Wednesday, rotation is likely to be rife among the Man City squad. Bernardo Silva (£7.6m) will be pushing heavily for a start in midfield or attack this weekend. 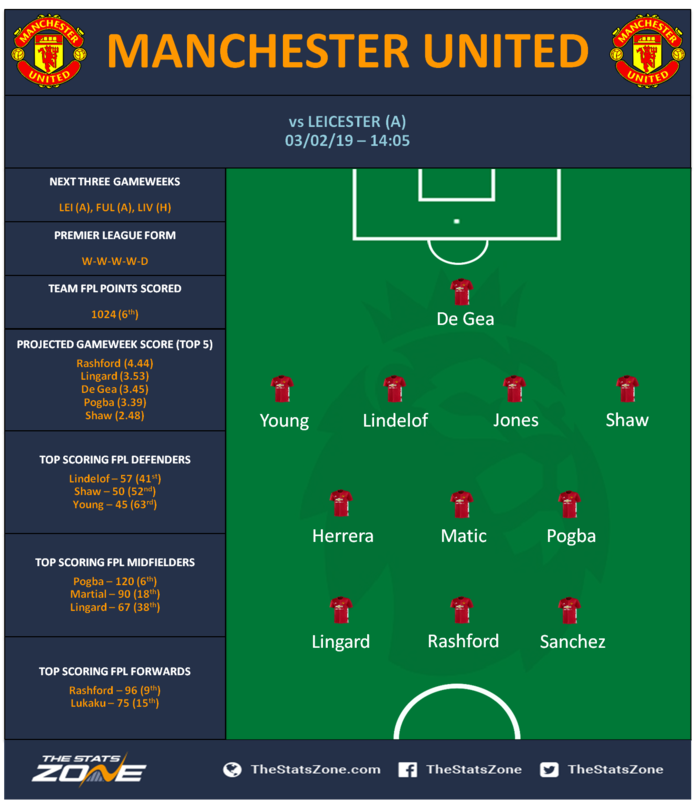 Paul Pogba (£8.7m) and Anthony Martial (£7.2m) should be fit for the trip to the King Power stadium. Ole Gunnar Solskjaer said: “We've not had a proper session since the game, so hopefully both of them can get through that. I don't think there's anything [wrong] with Paul. Anthony has done some rehab work, so he will try a session today, so I would imagine he would be available to be involved. He seemed happy yesterday.” Romelu Lukaku (£10.7m), Juan Mata (£6.2m) and Alexis Sanchez (£10.0m) are all options in attack if Martial is not deemed fit enough to start. 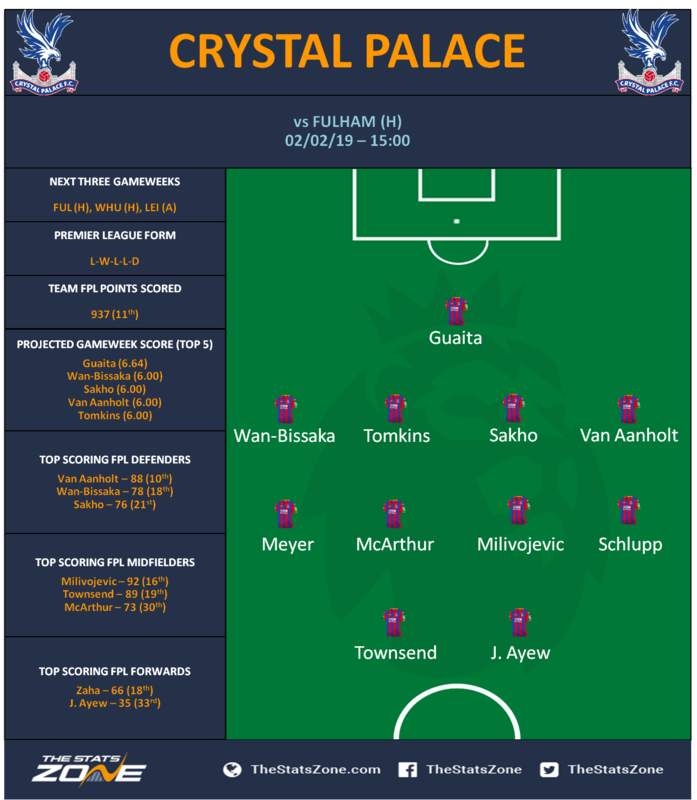 Pierre-Emile Hojbjerg (£4.4m) sustained a head injury in the Saints’ 1-1 draw at home to Palace in GW24. Ralph Hasenhuttl said on Thursday: “I don’t know how Pierre is with his head, it was a hard hit. The cut is not so important, but you always have to pay attention [with those injuries]. But he is a strong guy and I think he can handle this. Otherwise, I don’t know of any new injuries.” If the Danish midfielder is ruled out, Stuart Armstrong (£5.1m) could be in line for a start. 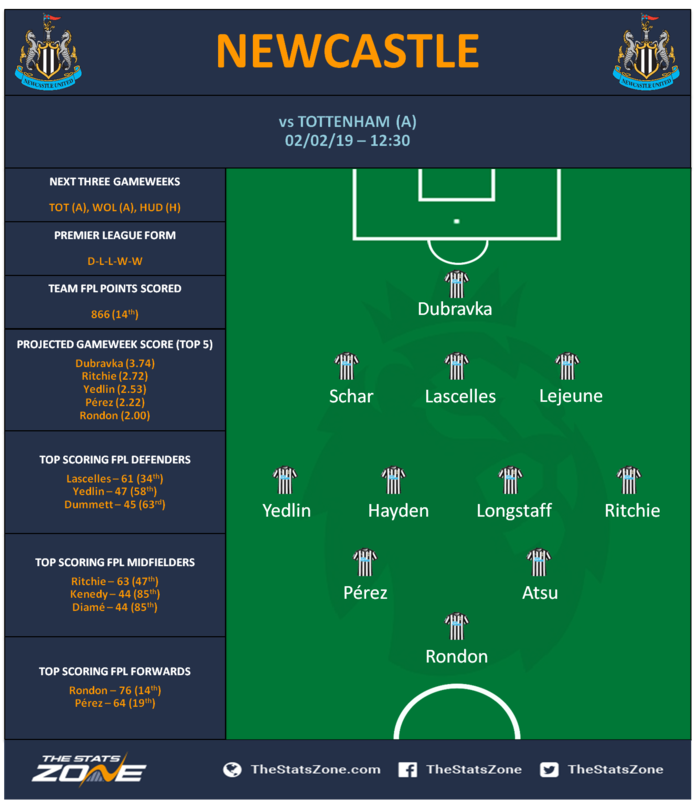 Pochettino may stick with a three-at-the-back system for Newcastle’s visit, with players such as Eric Dier (£4.7m), Erik Lamela (£6.1m) and Lucas Moura (£6.8m) all pushing for starts. Kieran Trippier (£6.1m) should oust Serge Aurier (£5.8m) after the Ivorian started midweek. Troy Deeney (£6.0m) and Roberto Pereyra (£6.2m) both picked up knocks in the 2-1 defeat to Spurs on Wednesday but lasted the full 90. Tom Cleverley (£5.0m) only managed 65 minutes at Wembley and may not be risked tomorrow. Gracia added: “We don't have a long time to prepare for the next game. We are ready today to recover those who played yesterday and we are all focused on Brighton and trying to do our best. They have enough time to recover today. Maybe tomorrow is the second day when they feel tired, but in three days I am sure they will be ready. We will take a decision on Tom. Maybe it will be tough for him to play more minutes, but in two or three days he will be ready.” Domingos Quina (£4.4m) could earn a start in central midfield if Cleverley is not deemed ready. Christian Kabasele (£4.4m) was available in GW24 but missed out on the matchday 18. 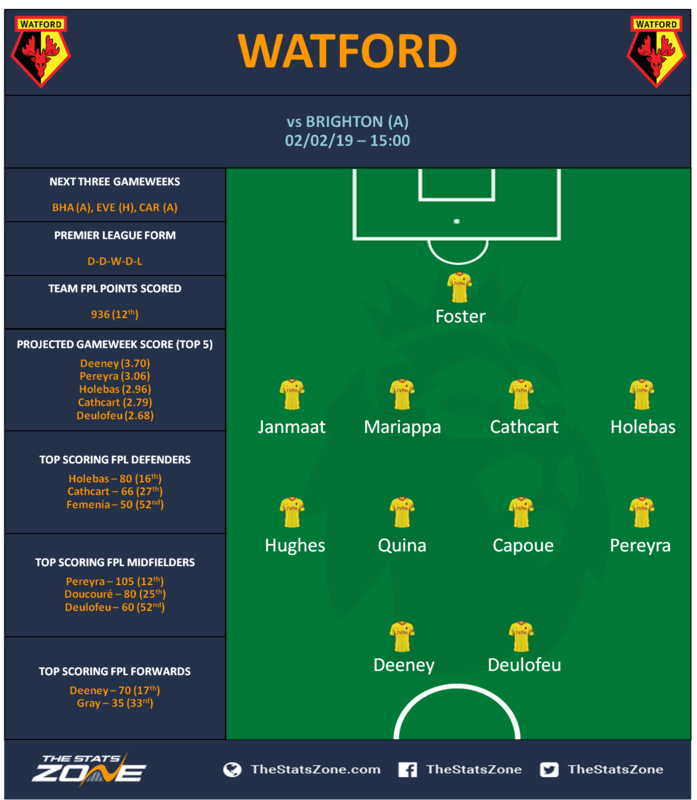 The Belgian and Miguel Britos (£4.3m) are alternatives to Adrian Mariappa (£4.2m) and Craig Cathcart (£4.5m) at centre-half. 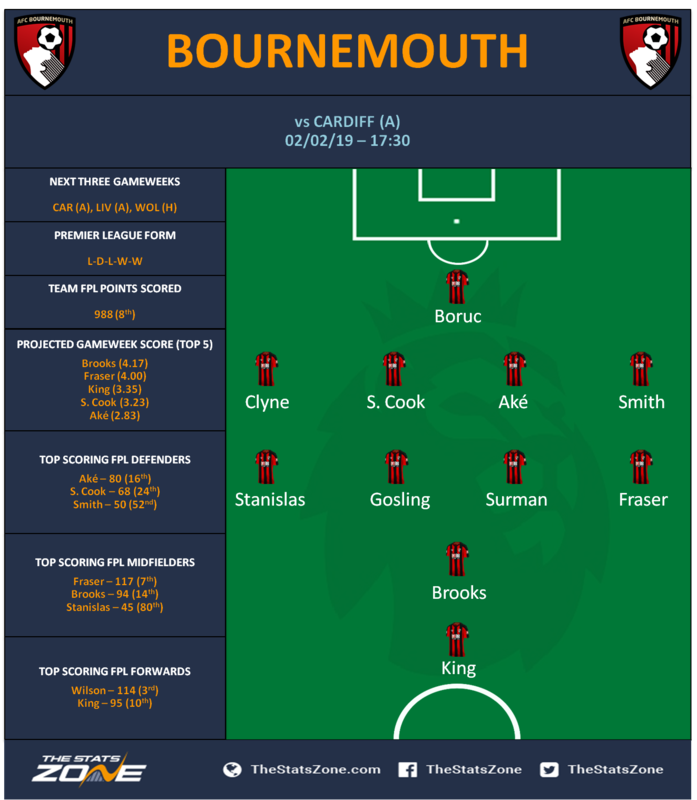 Ken Sema (£4.6m) is set to challenge Will Hughes (£4.9m) for the right-midfield spot, with the latter another candidate for a central berth. Marko Arnautovic (£6.9m) will be a late decision for West Ham’s clash at home to Liverpool on Monday night, while Lukasz Fabianski (£4.8m) is set to feature. Samir Nasri (£5.5m) remains out, while Aaron Cresswell (£5.0m) could contend with Arthur Masuaku (£4.3m) for the left-back spot. Manuel Pellegrini said: “We are not sure about Marko. We need to see the development and the pain in his foot. We have 72 hours more to see if he will be able to play. It's more a question for the doctor. We will see on Saturday and if he can kick the ball. Fabianski will be OK. He didn't work today 100 per cent but I think he will be able to work normally tomorrow. 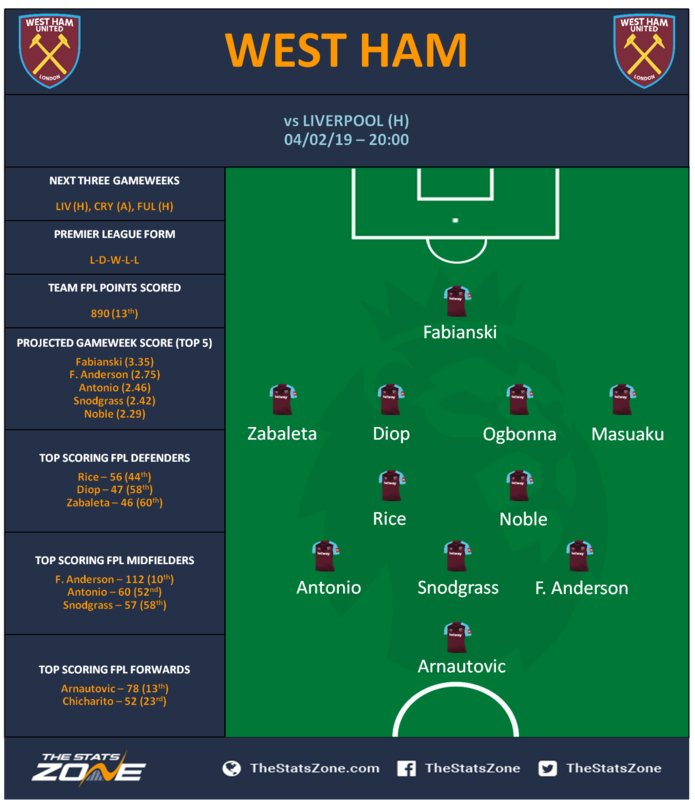 Aaron Cresswell is getting better, but Samir Nasri needs one week more.” Chicharito (£6.1m) and Andy Carroll (£5.4m) are Pellegrini’s options up front if Arnautovic is not passed fit. 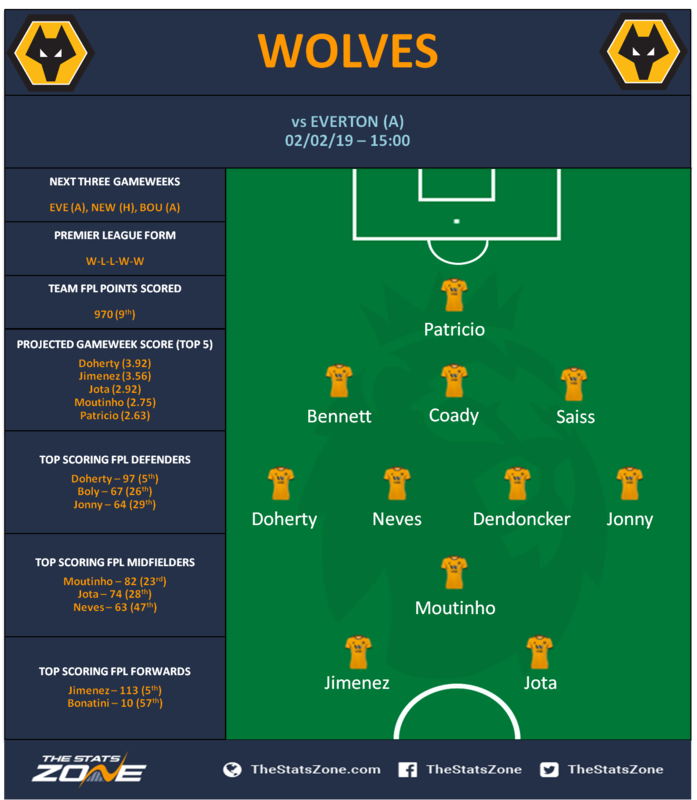 Wolves boss Nuno has no injury concerns ahead of the trip to Goodison Park. Willy Boly (£4.6m) returns from suspension, with the Frenchman set to battle with Romain Saiss (£4.2m) for the left-sided centre-back spot. The Moroccan opened the scoring in the club’s 3-0 win at home to West Ham on Tuesday.